"[S]o authentic the pages smell like cheap gin." Michael Simmons, on Barney Hoskyns' new Tom Waits biography, in LA Weekly. Jazz and the visual arts. There is a longstanding connection between jazz and the visual arts. It had its beginning in Paris of the 1920s, where, as the description of the Smithsonian exhibition The Jazz Age in Paris: 1914-1940 explains, a number of American musicians, many of who had come to France as part of the U.S Army forces during World War I, decided to sojourn or settle. They found a dynamic cultural environment that welcomed new modes of expression in music, as it did cubism, fauvism and other manifestations of the visual arts avant garde. As many of the jazz musicians took quarters in the Montmarte district where clubs featuring new music were located, they found themselves in proximity to the flats and studios of many painters and sculptors. Later, in the 1950s and 60s, the same propinquity between jazz and the visual arts was repeated in Greenwich Village, where abstract expressionists like Willem de Kooning and Jackson Pollock rubbed shoulders with John Coltrane and Thelonius Monk. A similar mixing of artists and musicians occurred in San Francisco's North Beach. 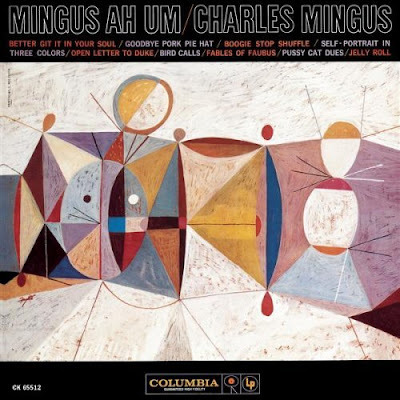 This proximity sometimes showed in the choice of jazz album cover art; for example, S. Neil Fujita's painting (update: for more on Fujita, who died in October 2010, see here) that adorns Charles Mingus's Mingus Ah Um. I was inspired to write this when I attended the opening party for "Jazz and Art/an exhibit celebrating America's musical art form" at the Hudson Guild Gallery, 441 West 26th Street, Manhattan. 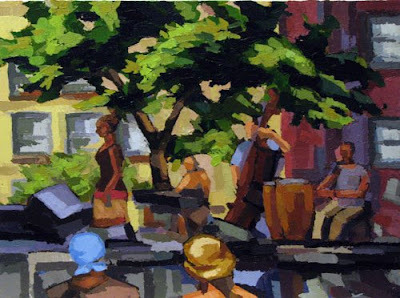 Included in that exhibit, along with many other works, is the painting Jazz Band at the Park by Michael Sorgatz, an image of which is at the head of this post. The exhibit will be open through June 10, 2009. The Mets seem determined to make a fool of me. All I had to do was get snarky about their early season woes, and what do they do? Take three of four from the defending champ Phillles, win a two game series from their arch-nemeses the Braves, and win two from the admittedly floundering Pirates, the effect of which has been to lift them to first in the NL East, by a half game margin. Nevertheless, the Times sees the Yanks' 12-5 drubbing by the Orioles as worthy of the front page of the Sunday sports section, while the Mets' 10-1 victory and ascension to the division lead gets buried on page three. Update: As you can tell, I carry something like a 2X4 on my shoulder regarding the Mets' second team status. Jon Lewin has this to say on the subject. Update-update: When I first posted this, I was tempted to add something about my hoping that saying good things about the Mets wouldn't curse them. No worries there, so far, as they complete their sweep of the Pirates, extend their winning streak to seven, and pad their division lead as the Phils lose again.